Set off down to Chew as I haven't fished it this year. Bought my ticket in the lodge and headed out for the North Shore. Arrived at 5 to find one other angler there, fished for 45 minutes, didn't see a single rise, and the other chap seemed to be changing flies a lot. It just felt a bit flat. Blow this! I suddenly thought. Tank 2 here I come!!! Back to the car, and over to the tanks (possibly rather faster than I should)...jogged down the bank of 2 towards the East end and could see a few rises. Chucked out the standard buzzer/DB combo and...whack! Fish first cast! These stockies had clearly read Trout 101 because they were rising in little pods swimming straight against the ripple. I was watching them come down the roadside bank and chucking the flies in front of them. You could tell when you were about to get hit (3-2-1....thump!). Really enjoyed it. After 2 very quickly on the buzzer, I took the DB off the dropper and replaced it with a buzzer, at which point, the next two hit the dropper, so it does seem like they were selective. Anyway, in summary each end of Tank 2 roadside is still absolutely loaded with obliging fish. Everyone said they were fishing buzzers. Also in summary I know I should have stayed on Chew and been all Zen and meditated on the Pastoral Beauty of it all, but frankly I don't have the moral fibre to resist the thought of pods of stockies parading up and down showing a bit of ankle. Got into the car to drive home and the radio was playing "Chasing Rainbows" by Shed Seven. Very appropriate! Blagdon today for me from the boat. Same set up as Chew last week. Black buzzers straight lined off a full floater. Excellent fishing only bettered by emergers being visibly sipped from the surface. Top end, static and hang on.......! Quality fish, all gone back so no spooning. First view of an Osprey down here for me. Boat league last night on Chew. Very well run and Chew fishing really well. Full credit to Andrew on organisation and to BW for providing the excellent fish and the Stoke Inn for pizza and chips. 20 out I think with average just over 5 fish. Fish well spread and taken to differing methods. Water clarity great. Buzzer hatching in profusion. Had an afternoon boat on Chew today but I didn't do as well as the Evening League lads last night. I set out at around 3pm in a lovely ripple and decided to have a look at the eastern side of Wick. Clarity was excellent at around 8 foot although due to the bright sun and cloudless sky I decided to set up an intermediate as well as a floater to enable me to fish my nymphs a little deeper. I started drifting over deeper water for the first couple of hours with both the intermediate and floater with buzzers, DBs, Tadpoles and Crunchers but there was nothing doing so when I saw a solitary fish move closer in by the reeds I decided to move closer and drop the hook . I had high hopes to start with but nothing interfered with my nymphs on the intermediate until I decided to replace the DB on the top dropper with a Blob and this resulted in my first pull but unfortunately the fish threw the hook. A few casts later I saw another fish come out of nowhere and have a go at the Blob in the clear water but it didn't stick and that was it for a while. I then tried a few drifts down below Wick into Stratford but that didn't work and as time was now fast moving towards the 7.50pm curfew, I decided to go back to where I started to the East of Wick for the last hour as at least I knew there were some fish there. As the sun was going down I elected to fish the floater alternating Crunchers and a Tadpole on the point with DBs on the droppers but nothing was working. In desperation I changed the point fly to a Tequila Blob and .. you guessed it! ... I got a savage pull on the next cast but unfortunately the fish spat the hook out while doing a great impersonation of a Polaris missile. Then just as I had concluded that it wasn't going to be my evening I got the gentlest of takes and after a short battle my blank was saved by a 2-8 Stockie that once again ignored my 'proper' flies .... and took the Blob instead ! I thought the idea of including a Blob on your cast when fishing nymphs was to pull the fish in who would then take your nymphs, but obviously the fish hadn't got the memo. Not that I'm complaining! Morning boat on Blagdon yesterday, looking for some of Marks 'cast out and hang on' sport at Top End. Turned out it was not to be, possibly due to the cold N/NE breeze. Very little fly life & no interest at all to nymphs or brighter stuff on floater, slime or D3 despite trying all over Top End. Half a dozen other boats around but I only saw one fish caught & that was from one that had anchored in the middle, suggesting fish probably deep. By about 11.00 I was bored & uncomfortable so decided to have a look in Butcombe, thinking at least it would be a bit less unpleasant. Turned out to be a good move. Different world altogether, much warmer, buzzers coming off and fish being caught. Several other boats about but everyone was on the drogue & being sensible & considerate which was needed in the variable gusts. I kept 2, lost a couple & returned 4, all around 2.4 to 2.12 & very good conditioned fish. Successful fly was the simple black buzzer - every fish took it on the middle dropper, ignoring the DBs on top & point. A couple of very chilly morning (Mon & Thurs) sessions last week. The frost warning light was glowing on both mornings as I arrived in the car park and on Thursday it also informed me it was 0C. To further cheer me up the water temp had fallen slightly from last week and the viz was about 8ft. Undaunted your correspondent was the first to leave the dock on each day and my decision to take gloves and a neck roll warmer for the ride to the Top End was a good one for this old timer! My set up was the same as in previous weeks with a GH nymph on the point and a single dropper about 6ft away with a #12 black DB nymph. All tethered to a 6wt floater. However this time I started in deeper water at 11 ft and found fish even deeper at 13 ft.
A slow start followed on both mornings with a highlight of watching the only other early angler on Thursday subdue an affronted 20lb plus pike. On both days the fish started to feed properly and deep at about 10.30 am and then switched off by about 12.30 pm. I gather that the pattern is now burst feeding on and off through the day. They averaged about 2lb 10oz with a number between 3lbs and 3lbs 8oz.. On Monday most took the small GH point nymph after a drop of about 40 secs. On Friday all without exception took the DB after a long drop of 70 secs. On each morning the retrieve was as slow as possible with a few tweaks to induce a lunge, My final fish on Friday was my 100th of this Season taken over six morning sessions and is certainly my best start to any Trout Season since 1977!! 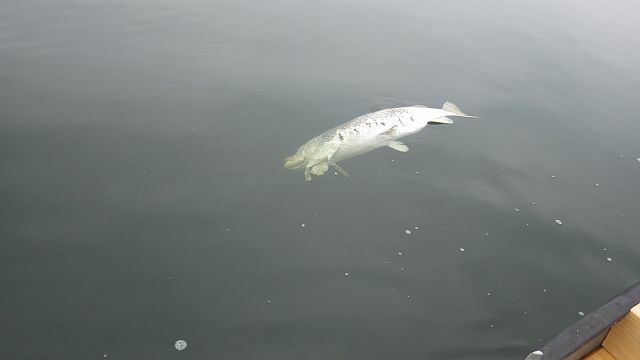 I haven't seen a cormorant damaged fish yet and their overall condition has been outstanding. I've been using 8lb plus fluoro and heavy weight hooks. With my technique anything much lighter for deep nymphing would be inviting disaster. It takes a bit to get this old'un excited these days but I have been re-energised by the fishing over the past month and have even started some serious fly tying again to seek a few variants rather than depleting the ancient stock box. Great report as ever Mc07 - my excitement this week was discovering that Sainsbury,Tesco and Waitrose were all giving 25% off wine. Decisions decisions decisions on who gets my business. I could look over to tank three from where I was, and I could see the wind was coming across it in an Easterly direction, but decided I'd use the last hour before sunset to try there anyway. The level was about a foot off the overflow on 3, and I fished the pipe for a while with no result. Decided to call it a day there as there was obviously nothing doing. As I was packing up I saw the first fish of the session move in the calm water behind the spit of the pipe, then a few minutes later, another one out in the ripples of open water. It was twilight by now, but I decided to try again. On went an intermediate and a big fluffy cats whisker. I thought I'd pull it along about 5 to 10 feet below the surface. Well done Tom! Your perseverence got it's just reward! I'll be glad to see the back of this Easterly wind though. It was cold last night, I was fishing green lawn where I had another jack pike on a damsel this time. I managed 2 rainbows last night also on damsel fished off a floater. Clarity was very good with large buzzers coming of the water, where house martins were mopping them up. Lots of swans on the lake practicing the landing techniques which always looks like it should end in disaster but somehow they manage to pull it off. Guy next to me had a few fish as well as a jack and was bitten off on numerous occasions. All the boats were moving around a lot this week looking for fish and did not see any boats up top end while I was there. I might try for a dawn patrol session at some point over the long weekend - maybe even take a trip down to Blagdon. Anyone else out and about over Easter? At last we have lost that cold easterly wind so I decided on an afternoon boat today on Chew today in order to avoid the morning rain. 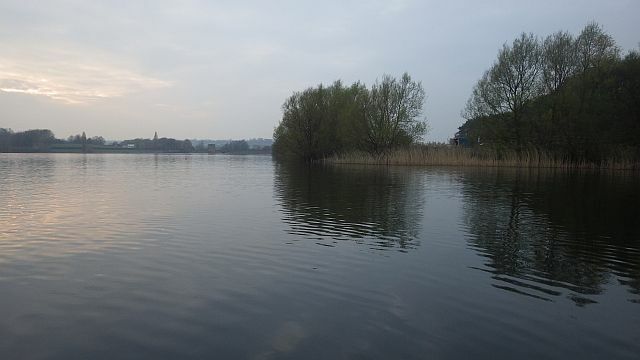 I arrived at around 2pm to find a flat calm lake, little or no wind, around 8ft clarity and mist hanging over the top of the Mendips so things were looking very promising as I set off across the lake. BWF released 2,400 fish from one of of the cages off Woodford this morning so I decided to avoid that area and start in Herons, which has been good to me so far this season. I started with the 10 foot #5 weight with a buzzer on the point and DBs on the droppers and was greatly encouraged by a couple of taps on the first few casts although they didn't lock up. As a result I decided to try the Bung put had no interest shown at all so when a couple of other boats arrived I decided to try elsewhere. Next stop was Wick where I decided to alternate between a D5 with Blobs and Boobies on the #6 over deeper water and the #5 weight and nymphs closer in. Again the fish showed no interest in either approach so I then decided to try North Shore. This plan was interrupted on the way over by a dozen fruitless casts off the north end of Denny when I saw a couple of fish move but it wasn't long before I arrived at the corner of North Shore by Picnic area 2. By now it was past 6pm and much of my early confidence was starting to drain away. I decided to concentrate on the nymph rod although I changed the point buzzer for one of my Black Tadpoles as I needed something to get me out of jail. That proved to be a good move when a few casts later the line tightened up and a fiesty stocky fought all the way to the net before being safely released. It took the Taddy. At not much more than around 2lb it was smaller than average but I never complain about a fish that allows me to avoid a blank! I was hoping there might be a few more fish by the reeds in that corner but nothing else happened so I decided to have a few casts at the other end of North Shore in the bay by Picnic area 1 before trying Walley bank although in the event that didn't prove necessary. My first cast resulted in a follow as I lifted off and the next hour or so resulted in plenty of stops, taps and pulls resulting in another 7 fish coming to the net. Most took the Taddy on the point although two had a GRHE on the middle dropper and one took a small Green Cruncher on the top dropper. All the fish were the same stamp as the first one I caught on the other end, averaging around 2-4 although they all fought extremely hard for their size. After the 8th fish was released things went very quiet until it was time to go in but I certainly wasn't complaining! I love 'soft' days like today on Chew ... !